The term “lost generation” is often used to refer to the generation who came of age in World War I, a term commonly used to refer to those who died in the war, especially those of the upper-class. These, the “flower of youth” were the young men aged in the early twenties in the war. The loss of these men had a huge knock on effect in Britain. In this book Nicholson looks at the women of that lost generation and how their lives were forced to change from their expected path to marriage and motherhood. These were the so-called “surplus women” the two million or so who would never marry, would never have children, and who were, in many eyes, a problem to be dealt with. I first spotted this book when it came into work with a batch of new non-fiction. I thought it looked interesting at the time, but before I could read it we had the van out and it was sent off to a branch. But then back in April Nymeth reviewed it which reminded me that it existed and I finally got around to recalling it last month. It was my read-at-work book, so it took me a while to get through, but I found it a fascinating read. The whole inter-world-war period is one that I’ve been increasingly interested in recently. Probably because I’ve read a few novels set in that period, but also because it really was a time of great change in society. The casualties of war must have had a huge effect on all around them. And this is clearly evident in this book. Before the war most, if not all women, saw themselves as wives in the future. The role of women in society had always been to marry and become mothers. But after the war that had to change. As one headmistress pointed out, only one in ten of her sixth form girls could hope to marry. The rest must look elsewhere for a future. This figure might have been slightly pessimistic, but the message she was sending was the right one. Her “girls” would not get to achieve their goal of getting married. These women faced hostility from society, some newspapers wanted them to be sent off to the colonies. If they stayed in Britain, unmarried, what role could they play? They wouldn’t have a husband to support them and so would have to steal jobs from those who really deserved them, the men! Ship them off and have done was the solution for some people. But for the women themselves, those who had grown up with specific expectations, those who had lost so much already, this was another blow, that they would never be fulfilled. Remaining spinsters forever. The spinster aunt. But these women were so much more than simply “extra” women. The paths they forged made life easier for subsequent generations of women who chose not to marry. The “bach girls” who succeeded in business and academia and life in general without men showed society that women could do more than marry and have children. This isn’t a statistical book. There are few hard facts and figures, it is more a collection of anecdotes and stories from the women at the time. This of course means that the figures may not be true. The two million from the title is certainly out. And as mentioned earlier, that headmistress was very much mistaken in saying that only one in ten women would marry. Nevertheless I did find this a fascinating glimpse into the lives of a very specific sub-section of society. And looking at it, how it impacted on the wider society around. 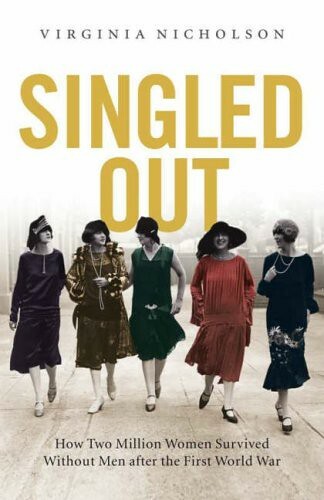 Without those single women who may have been forced into singleton, who knows, it may still have been expected that a woman give up her job once she married, dependent on her man for money and survival. All in all well worth the read. I'm glad you found it worth reading! Nicholson's approach is definitely more anecdotal than statistical, but to me that made the book more personal and richer from a human point of view. I've been meaning to read this for ages. Thanks for reminding me of its existence! Will add it to my 'must read more non-fiction' list. I would loan you, but twas a library book. That is a great review. Thanks. I didn't know this book but it sounds very ineteresting. I am planning on reading quite a few books that focus on war next year. This could be something I might add. It's amazing somehow that something so tragic, namely the huge loss of lives during WWI, had a positive consequence for women. I prefer anecdotal any day. Anecdotal certainly leads to more interesting story-telling, and so a more readable book. I added this to my wishlist after Ana's review as well. Now I want to read it extra badly :) I prefer more facts and figures but it still sounds fascinating! It really is. Hope you enjoy it, even without the facts and figures.